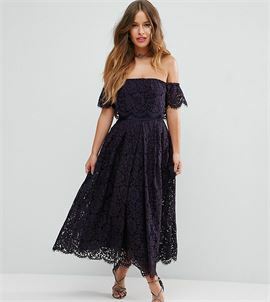 Midi dress by Chi Chi London Petite, Sequin embellished top, Bardot neck, Fluted sleeves, Lightweight tulle skirt, Very fine netting, Not just for tutus, High-rise waist, Regular fit - true to size. Chi Chi London are your go-to girls when it comes to dressing up. Whether you?re a prom queen, party princess or bridesmaid, Chi Chi London Petite scales down its occasionwear to perfect proportions to bag you that best-dressed crown.